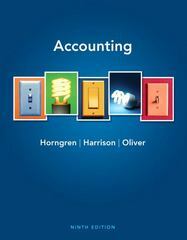 Accounting 9 Edition <>With its tried-and-true framework and respected author team, Horngren/Harrison/Oliver’s Accounting—when combined with MyAccountingLab—is the trusted choice for instructors and students of Principles of Accounting. To package MyAccountingLab with Accounting, order ISBN 0132785862. Accounting and the Business Environment; Recording Business Transactions; The Adjusting Process; Completing the Accounting Cycle; Merchandising Operations; Merchandise Inventory; Internal Control and Cash; Receivables; Plant Assets and Intangibles; Current Liabilities and Payroll; Long-Term Liabillities, Bonds Payable, and Classification of Liabilities on the Balance Sheet; Corporations, Paid-In Capital, and the Balance Sheet; Corporations: Effects on Retained Earnings and the Income Statement; Statement of Cash Flows; Financial Statement Analysis; Statement of Cash Flows; Financial Statement Analysis; Introduction to Management Accounting; Job Order and Process Costing; Activity-Based Costing and Other Cost-Management Tools; Cost-Volume-Profit Analysis; Short-Term Business Decisions; Capital Investment Decisions and the Time Value of Money; The Master Budget and Responsibility Accounting; Flexible Budgets and Standard Costs; Performance Evaluation and the Balanced Scorecard MARKET: For anyone interested in learning the principles of accounting.